Wado karate style was introduced in Estonia in the beginning of 90-es by sensei IGOR NEEMRE (3.DAN) and nowadays is represented by the ESTONIAN KARATE WADOKAI ASSOCIATION (shortly EKWS). President of the EKWS is sensei JAANUS SULG (4.DAN). There are local wado sport clubs around the country. EKWS is the member of the Estonian Karate Federation and our sportmen participate in the competipions of the Estoniana Karate League. Estonia is also member of the European Wadokai Federation. We have succeeded in Wado Kai European Karate Cups starting in Budapest 2006 and in Paris 2007. This is a result on of good cooperation of trainers work (sensei Igor Neemre , Madis Sinimets. Kajar Help, Silvar Uusna ) as the fine effords of our sportmen as Madis Sinimets, Kajar Help, Timo Paade and as organisational support from EKWS. 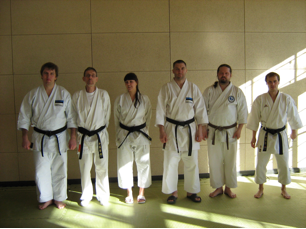 (from left to right) sensei Jaanus Sulg (4 dan), sensei Igor Neemre (3 dan), Heili Järv (1 dan), sensei Madis Sinimets (3 dan), Silvar Uusna (1 dan), Kajar Help (2 dan).